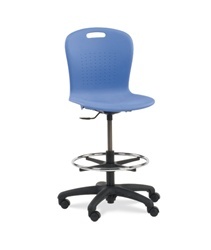 Choose lab stools from Virco's popular 9000, Metaphor, Zuma and Sage Series. Mobile 5-point base with casters. Virco 9260GCLS - 9000 Series Mobile Lab Stool with Chrome Footring and Black Base/Wheels - Seat Adjusts from 19" to 26 1/2"
Virco ZLAB - Zuma Series Mobile Lab Stool with Chrome Footring and Black Base/Wheels - Seat Adjusts from 19 1/2" to 27"
Virco 266017GCLS - IQ Series Mobile Lab Stool with Chrome Footring and Black Base/Wheels - Seat Adjusts from 20 7/8" to 28 5/8"
Virco SGLAB - Sage Series Ergonomic Plastic Mobile Lab Stool with Chrome Footring and Black Base/Wheels - Seat Adjusts from 19 1/2" to 27"
Virco N9LAB - Metaphor Series Plastic Mobile Lab Stool with Chrome Footring and Black Base/Wheels - Seat Adjusts from 18 3/4" to 26 1/4"